Despite the liberation of Mosul and Raqqa and the pending defeat of ISIS in Iraq and Syria, there are no near-term plans for U.S. troops to begin drawing down forces in the region. U.S. officials have been hesitant to discuss any withdrawal of forces where over 7,000 U.S. troops are deployed as part of the U.S.-led coalition to defeat ISIS. There’s still work to be done in the region, U.S. officials argue. In Syria, pockets of ISIS fighters are still clinging onto remote towns and villages along the middle Euphrates River valley. Removing the ISIS militants continues to progress as U.S.-backed Syrian fighters move along the eastern bank of the Euphrates. But the issue has recently been compounded by politics overshadowing the Syrian civil war. A near mid-air collision between U.S. F-22s and Russian Su-25s on Dec. 14 has once again thrust the overarching politics of the Syrian conflict into the smaller U.S. objective of defeating ISIS. And on Tuesday, Col. Ryan Dillon, the spokesperson for the U.S.-led coalition, criticized Syrian and Russian efforts to defeat ISIS in Syria. U.S. advisors in Syria have seen no downtick in operations in their mission despite the liberation of ISIS’ defacto capital in mid-October, according to Dillon. And as the fight begins to transition into stabilization for recently liberated areas, coalition advisers are still training local security elements like the Raqqa Internal Security Forces to maintain stability and the back clearance of explosive devices from the city. In Iraq, while Prime Minister Haider al-Abadi announced the liberation of the country from ISIS earlier this month, the militant group is still clinging onto territory in the Jazeera desert of the western Anbar province. The ISIS threat still exists in Iraq, but “it’s clear it is not as big as it once was,” said Marine Brig. Gen. Robert Sofge, the director of the Combined Joint Operations Center in Baghdad. And while intelligence-driven operations are still ongoing to find and kill the remaining ISIS fighters in Iraq, the U.S. train and advise mission of Iraqi forces is evolving to focus on new skills and premium training to transform the Iraqi military for a post-ISIS landscape. Clearing ISIS fighters from the desert regions in Iraq will be no easy task. ISIS fighters were easier to locate when they fought as a larger, more cohesive army. Scattered along the desert in remote pockets makes locating the fighters far more complicated. The role of U.S. forces in Iraq is slowly evolving. In November, U.S. forces reordered the lowest number of munitions dropped since September 2014 at only 1,000 bombs. But the fight isn’t over; the heavy air campaign is merely transitioning into a drone and intelligence collection operation to find and kill remaining ISIS fighters. “Inside the footprint we have, we are going to modify what we are doing now that the fight has kind of transformed,” Sofge explained. American and coalition advisors will also be adapting their training curriculum for Iraqi security forces in the days ahead. Some of the training provided to Iraqi troops was hastily prepared to respond to the ISIS invasion, according to Sofge. “Now is the time to give a world-class training in all aspects,” he said. 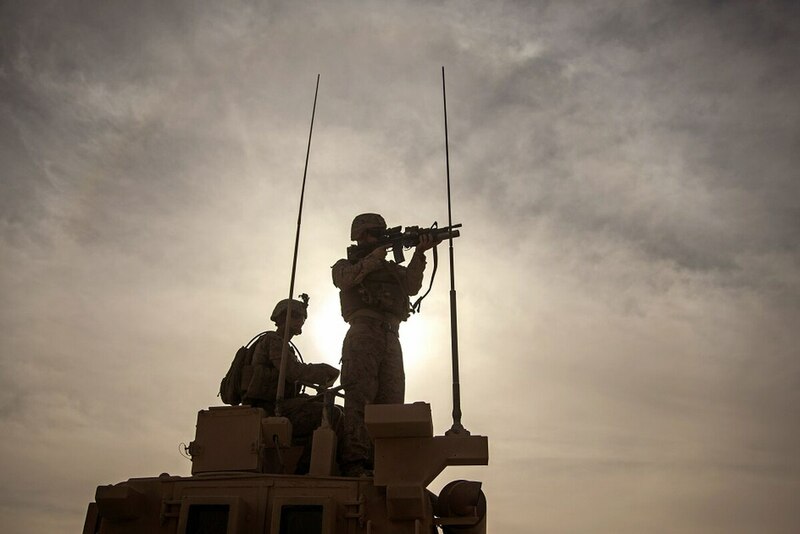 Two areas the Iraqis will need to improve upon are establishing a strong noncommissioned officer corps, “which simply doesn’t exist today,” Sofge explained, and incorporating world-class officer training. ISIS fighters in the region number less than 3,000, and the terror group has lost almost all of its urban strongholds. But in the days and months ahead, both Iraq and Syria face grave challenges. Syria has yet to contend with the underlying root causes of its own civil war, which continues to draw out the fight against ISIS, and the preconditions that brought ISIS’ rise in Iraq have not melted away with the group’s defeat. U.S. troops are merely adapting within the current troop footprint to tackle the new challenges in the region.